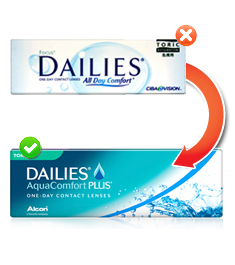 Designed for astigmatism, Focus Dailies Toric 30 pack contact lenses guarantee clear, crisp vision. 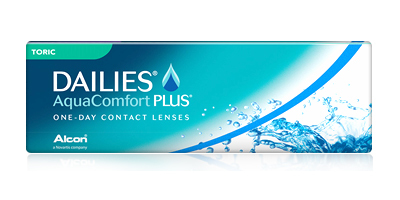 Now, people with astigmatism can enjoy all-day comfort and great vision with no hassles. When you buy Focus Dailies Toric 30 Pack lenses, you are buying the leading toric lenses using unique Lightstream technology. You will get thin edged lenses, which make insertion easy and wearing comfortable. Made of 31% polymer and 69% water, these lenses are suitable for every day use. The special integrated moisturising agent in the Focus Dailies Toric 30 pack lenses assures all day comfort. Your vision is safe and healthy with the dynamic stabilisation for correcting astigmatism and non-ionic surface for preventing protein deposition. Experience the ultimate comfort and convenience of a daily disposable lens while correcting your astigmatism by buying our Focus Dailies Toric 30 pack contact lenses. 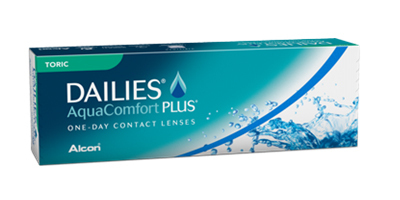 If you are new to contacts, then this is a great pack to start your lens wearing experience.